The last augmented reality game I played was Face Raiders on the 3DS, a game which turned the face of those playing the game into flying enemies which players could then shoot out of the sky. The new iOS AR game SkinVaders turns that idea on its head (geddit?) 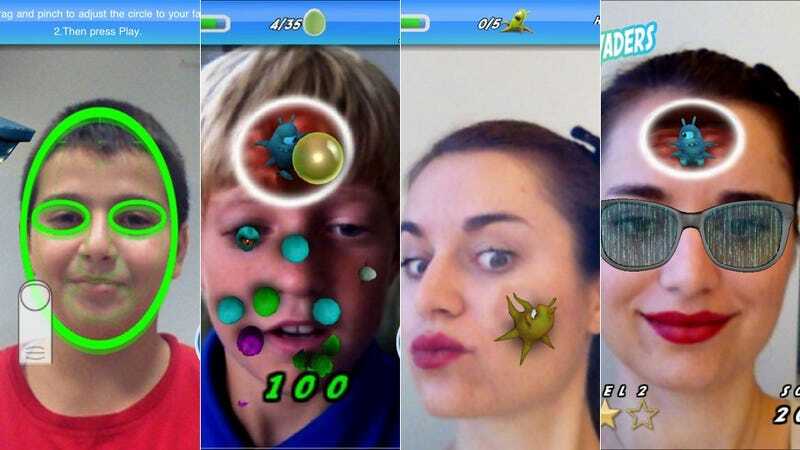 by using facial recognition software and the iPad or iPhone's front-facing camera to place digital beasties all over the players' face. It's very cool. It's also very gross. If anything, the little SkinVaders crawling around on my face remind me of that ghastly Lamisil ad with the digger that goes under your toenails. (Okay, I'm linking to it. But don't say I didn't warn you.) But as much as the game is about squishing alien bugs that lay eggs all over your face, it showcases a technology that's neat. The game was created by Total Immersion, a studio that has been working on augmented reality (or, AR) games for some time. To make the game, they used their new D'Fusion Studio, which is a free to download AR software designed for the cross-platform development of augmented reality games, from iOS to Android to the Kinect. • Multiplatform: Developers can create games and applications for a variety of platforms including iOS and Android™, Web, Microsoft® Kinect™ and kiosk. • Sophisticated: Superior markerless tracking-including face-tracking-quickly recognizes images as targets as they move through the scene and even rotate. • Efficient: D'Fusion Studio draws from a single authoring environment and a single set of assets (images, 3D models, scripts) to maximize efficiency. • Comprehensive: D'Fusion Studio boasts the unique ability to recognize an image from a target data store of up to 1,000 images (competitive solutions do not exceed a target data store of 30) – while maintaining the same recognition time, requiring only a slight increase in resource utilization (CPU, RAM). • Immersive: D'Fusion Studio's AR technology successfully blurs the lines between the real world and the rich digital universe of 3D allowing end users to deeply engage in the real-time experience without distraction caused by the technology. "D'Fusion Studio uses superior AR technology to get as close as possible to erasing the line between reality and the digital world," said Total Immersion CEO Bruno Uzzan. "Now, by making D'Fusion Studio free to all developers we've removed yet another barrier-developers are limited only by their imagination." The tech qorks surprisingly well in SkinVaders. It avoids looking like the aliens are simply moving across a 2D picture of you—they actually move along the contours of your face, pulling up cheek-skin and hanging off of your chin. Of course, again, I must stress that the entire thing is a bit troubling on an "ew" level. But cool, technologically. Plus, SkinVaders gives us press-release gold like the following: "SkinVaders is the first game to use Augmented Reality to physically bring you-specifically your face— into a game."